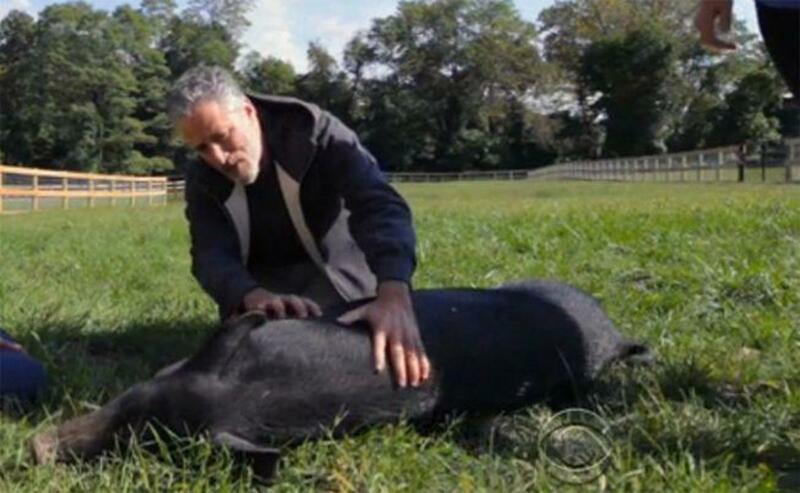 Middletown, NJ – In an effort to be the change he wishes to see in the world, comedian John Stewart, after stepping down as host of “The Daily Show,” has started a sanctuary for abused factory farm animals called Bufflehead Farm. Jon and wife Tracey announced on Saturday that they will become part of Farm Sanctuary’s network of animal safe havens at the annual Farm Sanctuary gala in New York City. Bufflehead Farm, located in Middletown, New Jersey, is a 12-acre non-profit animal rescue sanctuary owned by Jon and Tracey Stewart, which will soon become home to dozens of cows, pigs, sheep, turkeys and other animals rescued from factory farms. Stewart has consistently been an animal welfare advocate on his show, once devoting a comedy segment to the foolishness of New Jersey Governor Chris Christie’s refusal to sign a bill that would end the lifelong confinement of pigs in crates too small for them to turn around. Tracey Stewart is known for her advocacy on animal rights, recently publishing a book on the topic. The project has long been a dream for Tracey Stewart, an animal advocate and former veterinary technician, who has tirelessly worked to promote a plant-based lifestyle, animal welfare issues, and support for organizations like Farm Sanctuary. Jon Stewart, accompanied by his wife and two children, were honored at the awards ceremony held by Farm Sanctuary, an organization founded in 1986 to combat the abuses of factory farming and encourage a new awareness and understanding about farm animals. “I’m a little uncomfortable. I’ve spent the last 20 years immersed in the world of Washington politics and the media landscape, so I don’t know how to deal necessarily with people who have empathy,” Stewart told the all-vegan banquet at The Plaza Hotel in New York. The consistency of the Stewarts should be applauded. Rather than simply paying lip service to a cause, they are putting in the groundwork to support their espoused beliefs. Similarly to how Morgan Freeman turned his estate into a bee sanctuary, Stewart has shown that celebrities have the ability to not only motivate others by raising awareness about issues, but to lay the actual foundation of real world change.